Hey everyone....I got published! 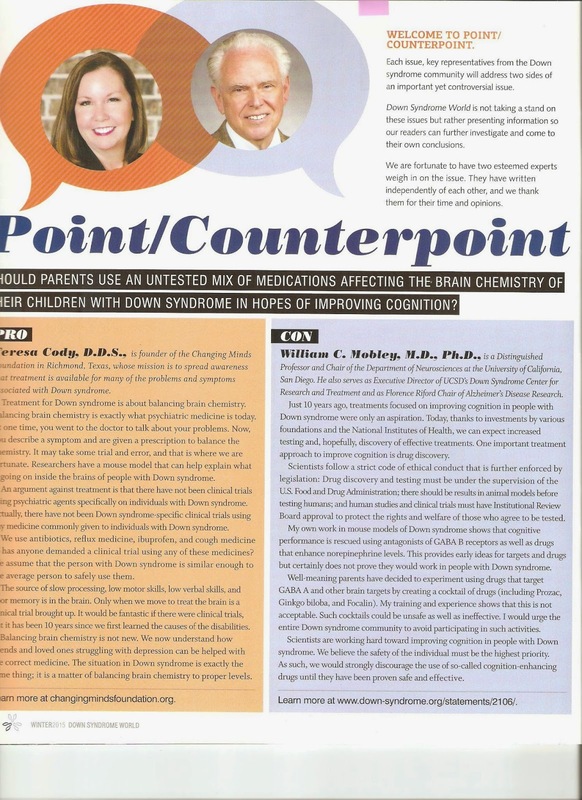 Check out the latest edition, the Winter issue of Down Syndrome World, where I answer a Point/Counterpoint question along with William Mobley, M.D., Ph.D.. I have attached the article here so you can all read it since you have to be a member of Down Syndrome World to read the digital version of the magazine. First of all, read the question. Is that not the MOST biased way they could have worded that question? Ha Ha Ha! Also, keep in mind when you read what Mobley says....that he is a researcher, NOT a clinician. He does NOT see patients, and he says "my training and experience shows that this is not acceptable." Please read the article and leave your comments below. I would love to hear what everyone thinks! I attended Dr. Cody's first CMF conference in 2010, and had the privilege to personally speak to researchers there from Stanford University. They were all in support of CMF. Unfortunately it seems as though Dr. Mobley is not aware that not everything in medicine needs to have double blinded placebo controlled studies to be used in given practices. My husband is a practicing MD Orthopedic Surgeon and spoke on this very topic in 2013. I will post his talk in the comments. My son has been on full CMF protocol except Focalin for almost 5 years now. I am very happy with how he is doing, no side effects, good memory, fully engaged, social, follows directions, plays appropriately with peers, he's very smart!!! I can confidently say CMF has played a major role in his development. It's long term that I'm shooting for and as the gap widens for untreated children with DS I can only hope and pray that the CMF protocol and other interventions I've instituted with my son will result in a much narrower gap. The proven neurogenesis that is obtained with the CMF protocol can not be obtained to the same degree with any other natural supplement. This is a given fact. I thank the Changing Minds Foundation, and look forward to hopefully seeing good statistical significant results with the first human study that is now in place using Prozac in the prenatal period. CMF is helping to fund this first ever prenatal pharmacological study. Many thanks to Dr. Teresa Cody for having the courage to step out and teach the world how to treat DS!! I am forever grateful!! The left edge (about 3 letter) is missing, but it is still possible to read with moderate struggle. Focalin and prozac are not medicines that I would be prepared to experiment wihout some more convinving evidence. How about a survey of per=ople who are currently or sho have done it in the past?